lizzy write: ay ay matey! 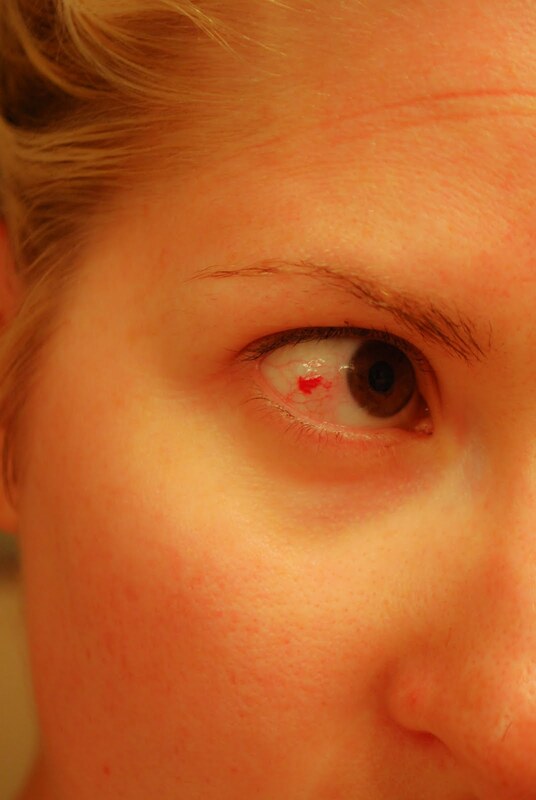 Baby fingers may be small but they can do this kind of damaged when jammed into your eyeball unsuspectingly. It didn't hurt until I looked in the mirror and totally grossed myself out. Blood in the eye is not one of those attributes you want, especially since it's quite sinister (Le Chiffe?). I'm considering getting a eye patch. Am I damaged forever? My friend was just telling me her great grandmother got her eye jabbed out with a fork from her toddler!!! It's scary what kids can do when they don't know what they're doing! It's probably a good thing he hit the white of your eye and not your iris! Yikes!! That looks like it hurts! Babies sure have fast little hands! I'm only laughing because I can totally relate!!! The blood vessels will heal...by then you'll probably have a new injury : ) Welcome to life with boys!!! Oh my goodness!!! Little fingers are powerful! I think that is a reason to make more gelato! I had to totally laugh when I read your post. I totally feel your pain. My 18 month old little guy broke my nose with a surprising headbutt last month. These are the moments we'll look back on during our journey through motherhood! I found myself noticing your perfectly tweezed brows first and THEN noticed the red eye.